The original Harbour was built in 1784, Cromarty Harbour trust was established the same year. 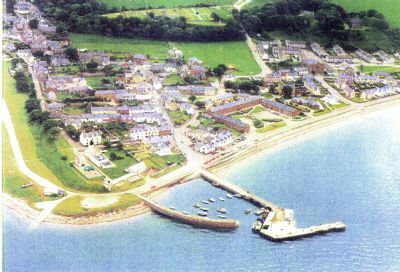 The Cromarty Harbour Trust is constituted by two Acts of Parliament and two Harbour revision Orders. A significant addition in 1914 was the Admiralty Pier. This is currently unsafe and is not used for mooring vessels. Although one of the oldest working Harbours in this area, for many years the harbour started to fall into decline. A number of projects were started to try to improve the harbour facilities but hit many setbacks before finally in 2004 the CHT achieved success in dredging the basin and installing pontoons. The original Dredging took the depth on the pontoons to Chart datum +1.5m, however there has been steady silting due to tidal eddies and by the end of the 2007 season the depth was less than Chart datum +.75m. The Trustees are planning to dredge every five years but this must be self financing using income generated from the pontoon users. Although Cromarty Harbour is relatively safe, boats moored on the pontoons do experience considerable motion in strong winds from Westerly round to North Easterly. Vessels should ensure they have adequate fendering in place. Boats entering Cromarty Harbour should also be aware of strong tidal sets on both the Flood and the ebb especially during Springs. Cromarty Harbour Trust is run by a team of volunteers and is not subsidised in any way. Any repairs or maintenance work undertaken, such as the necessary dredging, has to be self financing. All harbour dues received help towards these vital repairs and the upkeep necessary to secure the long term future of this historic harbour. The Harbour Management Group run the day to day operations at the harbour and key contact is Ronald Young (Harbourmaster) - 07751244065. Please contact Ronald on all operational matters or if you feel you could lend a hand on a voluntary basis, please check out our Contact Us page. Please note VHF Ch37/16 is not continually manned.